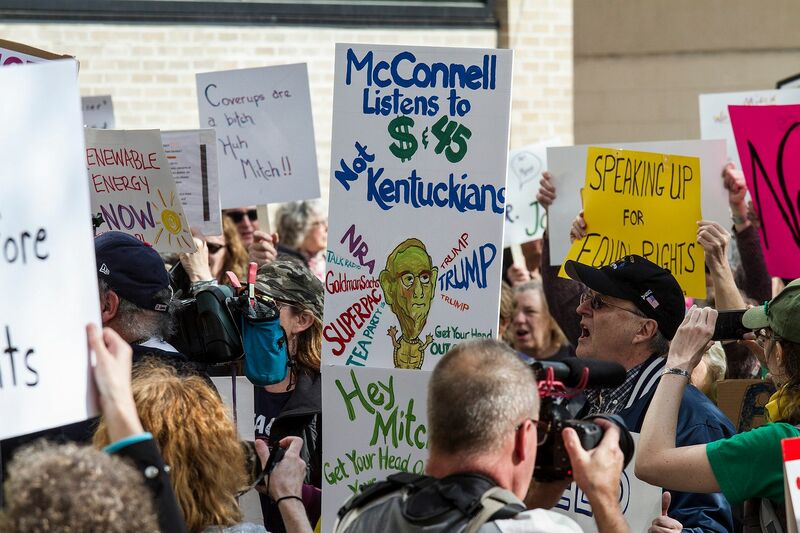 During a short speech Thursday afternoon to the Northern Kentucky Chamber of Commerce and the Cincinnati USA Regional Chamber, Senator Mitch McConnell was surprisingly wry, considering that outside Hotel Covington, hundreds of people gathered to protest his visit to the city. 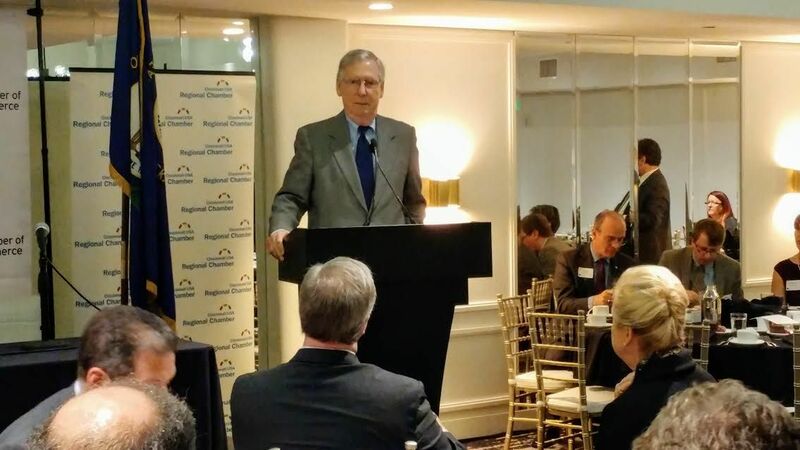 "I'm often asked what it is like (to be Majority Leader of the U.S. Senate)," quipped McConnell, the Republican who is serving his sixth 6-year term in Washington, D.C. "I say it's like being a groundskeeper at a cemetery. Everybody is under you, but nobody is listening." The line drew laughter and applause from the crowded hotel ballroom where guests spent $65 to lunch on fried chicken and to hear McConnell speak. His remarks were interrupted twice, and each time the police and security quickly swooped in to remove the protesters. Outside there was occasional laughter, too, or a satirical sign poking fun at McConnell or President Donald Trump. 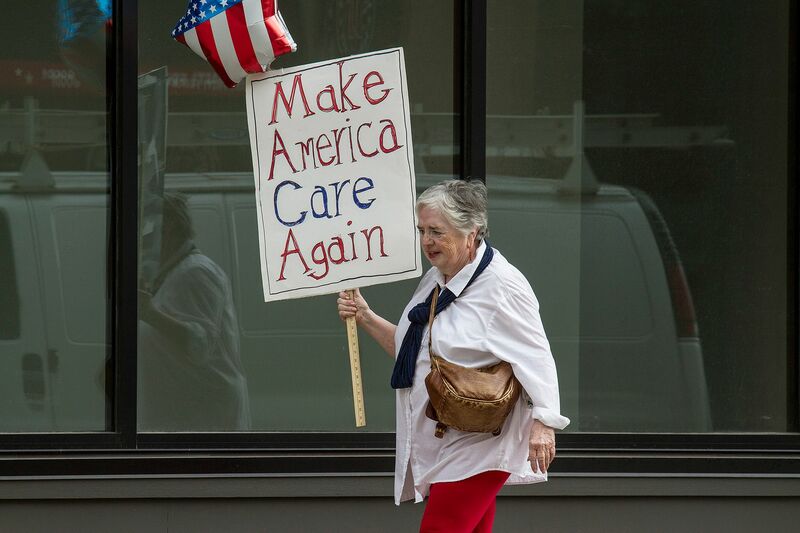 But mostly, through a series of speakers and even patriotic songs, the large crowd that shut down Seventh Street outside the hotel shouted their concerns about the threat to the Affordable Care Act, environmental protection regulations, and other issues that arose from the administration of President Barack Obama. The event was dubbed "People Before Profits", and was organized by a variety of local groups, some partisan and some not. If Obama's presidency sparked a series of protests that evolved into the Tea Party, which disrupted national government and Republican politics arguably culminating in Trump's election in November, we may be seeing the early signs of a liberal counterpart. 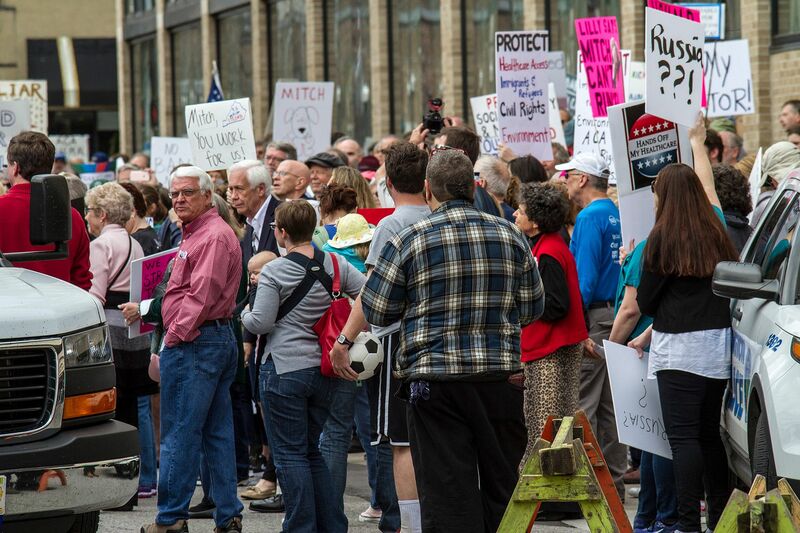 McConnell was greeted by an equally enthusiastic bunch of protesters in Lawrenceburg on Wednesday. His fellow Congressional Republicans - and even some Democrats - are finding an angry constituency back home. To McConnell, though, it's mostly sour grapes. "Protesting is as American as apple pie," he said at the top of his remarks, before suggesting that the Seventh Street crowd was among those Americans not happy with the outcome of the November election. 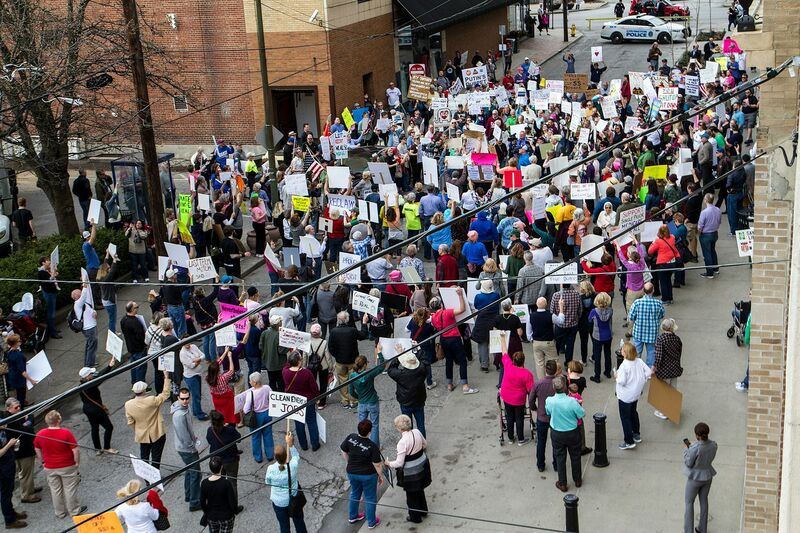 He also discounted the independent groups from Northern Kentucky and Cincinnati that organized Thursday's protest, arguing that the Democratic Party was behind it. "They're trying to figure out some way to launch a comeback and that's fine. Everyone can have their fair say about public policy." The country, he said, was simply ready to move in a new direction after eight years of Obama, and chose Trump over Democratic nominee Hillary Clinton in a contest between unpopular candidates. Mostly, McConnell stuck to familiar themes and vague policy promises. He followed a brief panel discussion about transportation and tax policy (featuring University of Cincinnati president Dr. Neville Pinto, Macy's, Inc. vice president Frank Julian, and Transit Authority of Northern Kentucky director Andrew Aiello), and congratulated CVG Airport on its recent addition of Southwest Airlines and low-cost flights, the forthcoming Amazon expansion, and said that the Brent Spence Bridge project - a favorite of both chambers - is really a Frankfort issue, and not a Washington one. McConnell also promised that the Republican agenda would include a "replace and repeal" of the ACA, or Obamacare, though when asked by The River City News afterwards, he would not say what "replace" might look like. He met with the press - some of whom represented national networks and wire services - in a separate room after lunch. Not a whole lot of new remarks were offered. He still frowns upon the new President's frequent use of Twitter and disagrees with Trump that the press is an "enemy of the people". After taking questions, and again insinuating that the protests are mostly based on sour grapes and are organized by Democratic activists, the afternoon was finished and the press members were moved out of the room so that McConnell could host a private meeting. About a hundred protesters remained outside Hotel Covington to bid the senior senator farewell.